Introducing our Flash Friday Sale! 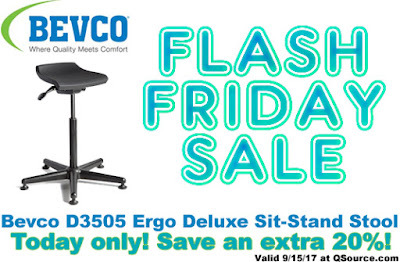 Get an Extra 20% off the Q Source price of Bevco’s D3505 Ergo Deluxe Sit-Stand Stool. To take advantage of this discount, just add the eligible stool to your shopping cart. Our Flash Friday Sale promo is valid Friday, September 15, 2017 only at QSource.com. This deluxe sit-stand stool promotes high levels of productivity and encourages a healthy work environment. It’s ergonomic shaping and waterfall design provides pressure relief and improved circulation. Please see the product page for more details. Our new Flash Friday Sale offers a big discount on a popular product for one day only. Follow our Flash Friday Sale selections at our Q Source Resource Blog, by subscribing to our email newsletter, or on our social media accounts. We’d appreciate if you could help us spread the word about these great money-saving opportunities by sharing these offers with your friends and colleagues. Click here to purchase this Bevco Sit-Stand Stool. For further questions, call us (800-966-6020), or send us an email. Please note: This promo is valid only at QSource.com.